One stellar plant for this space is Lantana camara ‘Miss Huff’. This plant gets quite large and loaded with a variety of butterflies. Lantana ‘Miss Huff’ is a perennial that offers nectar all summer and fall until the first hard frost. I’ve seen monarchs feeding on it in as late as October as they are migrating south. Another successful host plant in my butterfly garden is bronze fennel (Foeniculum vulgare ‘Purpureum’). I love the soft wispy texture of the fennel foliage. 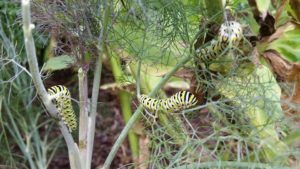 Bronze fennel foliage offers a place for black swallowtails to lay eggs and for emerging caterpillars to feed on. Each year, I get so excited to watch as groups of caterpillars are munching away. Lastly, I incorporated muhly grass (Muhlenbergia capillaris) as a shelter plant for caterpillars to form cocoons. This native grass offers a spiky texture from spring to summer, then a cotton candy cloud of pink blooms in the fall. I repeated this plant from other areas in my landscape to tie in nicely with my butterfly garden. Interested in creating a butterfly garden in your yard? Contact Bright Leaf Landscaping at 919-619-4460 or fill out our online contact form. Design and installation are our expertise, and we are always happy to meet with new clients to discuss potential projects!